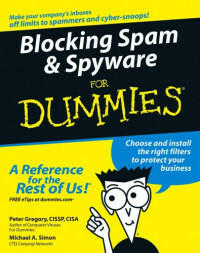 Blocking Spam & Spyware For Dummies is a reference. That means you're not expected to read it, starting with Chapter 1 and eagerly turning pages late into the night until you reach the exciting conclusion. In fact, let us tell you the end right now: The butler did it - that is, if the butler is an annoying spammer in his spare time, running the operation from a laptop in the basement. The pages of this book are what computer geeks like to call "random access." You can open up to any page you like and start reading there. On the other hand, choosing pages at random seems like a slow way to acquire the information that really interests you, so . . . This guide was written for those who will manage or fund technology projects with budgets between $25,000 and $500,000. Our goal is to provide a quick-start guide for professional, smart, competent people who are new to web project management, or who need some guidance on how to manage a web project.